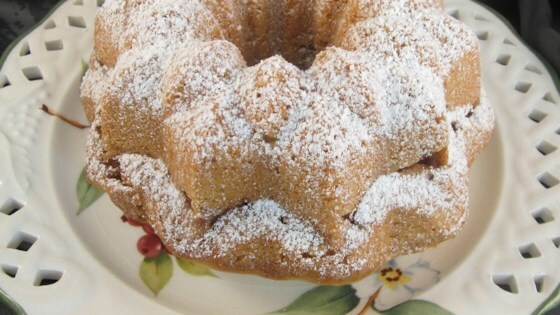 "A delicious Bundt cake, combining the wonderful flavors of apples and cinnamon. An updated version of Grandma's favorite apple cake!" Preheat oven to 350 degrees F (175 degrees C). Grease and flour a 10 inch Bundt pan. Sift together the flour, baking powder and salt; set aside. In a large bowl, combine sugar, eggs, oil, orange juice and vanilla. Beat on high speed of an electric mixer until blended. Beat in flour mixture. Fold in chopped walnuts. Pour 1/3 of batter into prepared pan. Mix together chopped apples and cinnamon chips, and sprinkle 1/2 of mixture over batter in pan. Repeat layers, ending with batter. Bake in the preheated oven for 55 to 60 minutes, or until a toothpick inserted into the center of the cake comes out clean. Let cool in pan for 10 minutes, then turn out onto a wire rack and cool completely. Sprinkle with confectioners' sugar before serving. See how to make a simple loaf cake layered with apples and cinnamon. The biggest kid at my house loved it.